Lesson of the day: everybody has a vendetta against Hua Qian’gu. A trailer has been released for the drama starring Wallace Huo, Zhao Liying, Jiang Xin, Zhang Danfeng, Ma Ke, Li Chun, and Bao Tianqi. 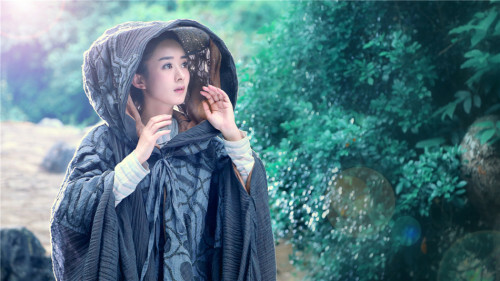 From it, we can see the path of Hua Qian’gu (Zhao Liying) from the last God on earth to being the only apprentice under the Immortal Bai Zihua (Wallace Huo), her struggles to save her teacher, the factors leading to her eventual corruption to also become the Demon-god, the build up to the War of the Worlds, her decision to force Bai Zihua to destroy himself, and their reuniting after reincarnation. Thehy They even provided a English-dubbed trailer here so you can appreciate the Chinese dubbing. This entry was posted in Drama, Mainland China and tagged Flowers of Bones, Hua Qian'gu, Jiang Xin, Li Chun, Ma Ke, The Journey of Flower, Wallace Huo, Zhang Danfeng, Zhao Liying by 0kuo0. Bookmark the permalink. What the eff was the English version. Are they planning to release an English version? Are they planning to broadcast it in English speaking countries? I don’t see the point in creating one, unless it’s to make us cringe. Bai Zihua sounds really hammy and watermelon-guns-buff and Ma Ke’s sounds like an evil squirrel. Skipped through parts of it.. The Chinese trailer looked really pretty though…and the general scenery looks nice. I’m getting tired of the cute girl niche, but Wallace Huo is pretty and Jiang Xin is worth a watch. Also, Ma Ke made me snort. Maybe they were testing the waters to see how people react to the English dubs? I hope they choose to English sub it (not dub!) instead!! I couldn’t stop laughing during the English dubbed version since it reminded me of cartoon dubbing. But actually, the English narration was pretty good since there weren’t any huge grammar fails. I also liked some of the English voices better since they were less nasal/high-pitched. I was shocked at how good the English translations were haha. Too bad they didn’t pick a better English title, though. I did not like the book, but the trailer looks really good! The cinematography alone is a huge step up from City of Hopeless Love. I feel like next year is going to be huge for Zhao Liying. Also, I kind of like the English dubber for Bai Zihua, but the dubber for Hua Qian’gu is ….